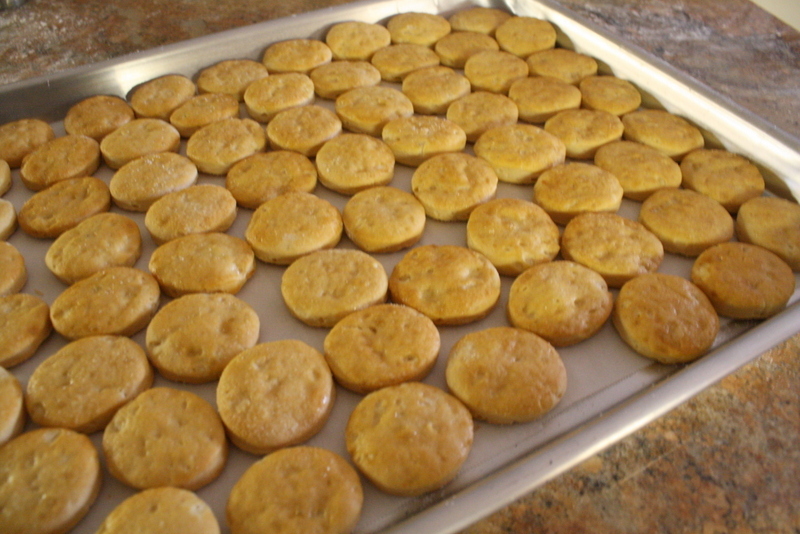 Place the the biscuit circles on parchment paper and brush with an egg wash and sprinkle each one with sugar. They are done when they’re a nice golden brown, about 10 minutes. 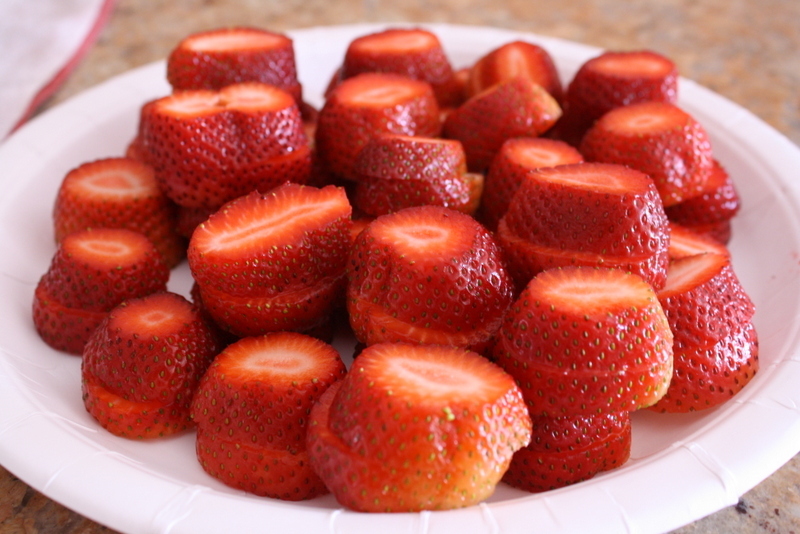 Now prepare the strawberries. First wash and dry all the berries. Cut the tops off. 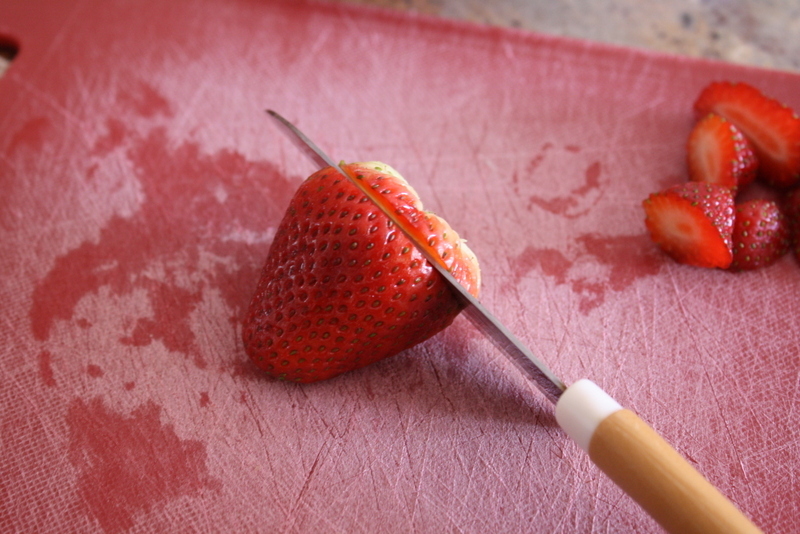 Then slice in half, giving you two strawberry circles. I stacked them together and the kept each of the two pieces together, so it would look more uniform on one skewer. I cut my skewers down in size to about 6 inches so they would look nicer. You don’t have to do that. Now just start layering with the biscuit, whipped cream and strawberries. Start and end with a biscuit. Easy peasy. It was fun to make and even more fun to eat. 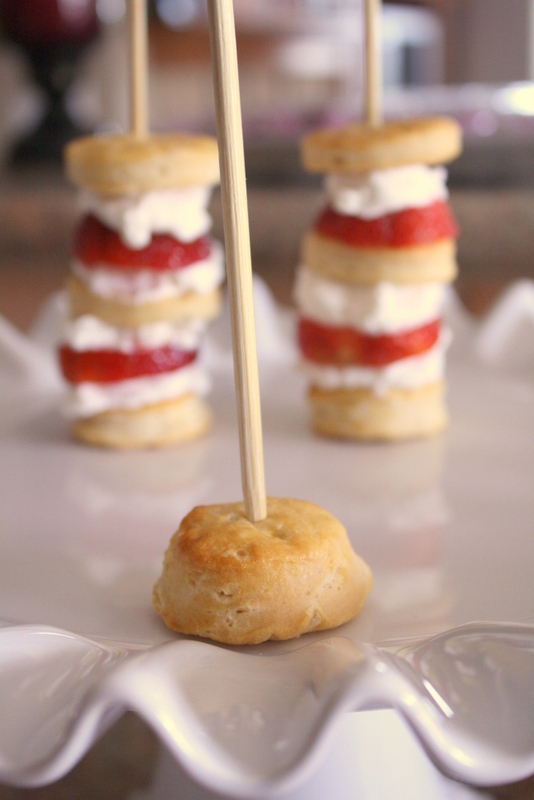 These were a hit at the tea party and they are fun to slide right off and pop into your mouth. I really like this idea. Looks good! Looks yummy. BTY: can your dad make me a cookie cutter too? 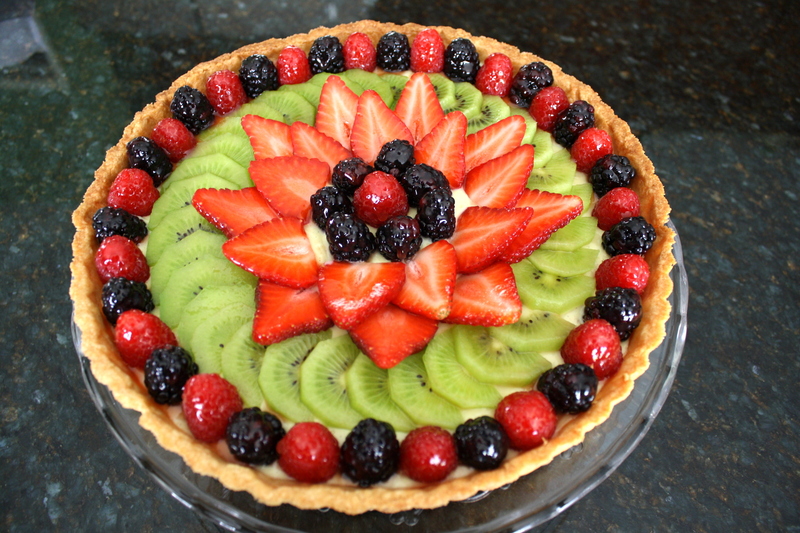 Karen- We are a small, non-sponsored blog, who posted your photos on our blog as a cute idea for a dessert. We thought that citing your site as the site to follow for directions and visuals would create traffic for you and did not intend to take credit for the photos. We also do not have nor have ever joined Pinterest in order to avoid not “giving credit where credit is due.” We will happily remove the old post but are fearful that “Karen in the Kitchen” will then receive no credit. We apologize for any trouble or angst this may have caused you-as our intentions were just to show how your treats came out. Thanks for making me aware of your post of my pics. I appreciate your honesty. Feel free to keep the post on your site. Your link to my site has definitely increased traffic on my blog! Will the cream hold up if made 24 hours in advance? I’ve always made whipped cream and used it right away. There is a possibility of the cream collapsing and getting watery. There is a product you might want to try that will keep your whipped cream stiff for days. It is a stabilizer. It’s a German product called: “WHIP IT” by OETKER. I have found it in the baking aisle at some grocery stores, as well as Cost Plus World Market stores. Hope that helps you! Will try to find this “Whip It”. We live on Aruba and I am hard-pressed to find something that won’t melt! I hope this works! Going to try the Marshmallow and whipped cream, too. (*Yes, I also found your site as a result of Kris’ pin. Don’t know what the big deal is with those who oposed it! If you can’t find Whip It, try using one teaspoon of cream of tartar. That should help the whipped cream to not bleed water after sitting too long. Hope that helps. Strawberry shortcake is my favorite dessert. I can’t wait to make these with my Granddaughter. I know they won’t last very long at our house! If I make the kabobs a couple hours before serving, will the whip topping last that long? Yes it should be ok for about 2 hours. 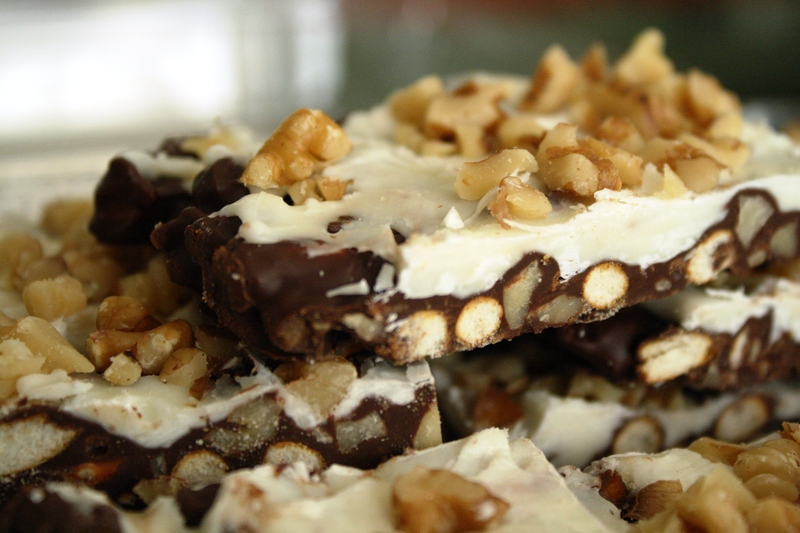 I plan to make these and drizzle chocolate on them! Making them for a baby shower… they look wonderful..Thank you. That should be fun. Hope everyone enjoys them! Have you ever used ready whip or cool whip? How does it hold up? I have not used ready whip or cool whip for this. I don’t think they will hold up as well because there is too much air in cool whip and it is not as thick as homemade whipped cream. Won’t the dough taste like a biscuit ? Strawberry shortcake, from scratch is made just like a biscuit. The sugar you sprinkle on top will make it sweet for the dessert. Pingback: Something on a Stick Day Celebration | LookWhatMomFound...and Dad too! How many kabobs does one recipe make? It makes about 16 kabobs. I used the can whipped cream, it has a stabilizer worked perfect for baby shower…. Your Dad sounds like Mine. I have a cast iron pancake griddle that fits across both burners on the stove that he cast when he was working in a foundry. He could make/fix anything! Did you have any problems with the biscuits breaking when you put the skewers through them? These are so adorable and delicious! I used 1 tablespoon gelatin dissolved in 2 tablespoons hot water per 1 cup of cream and after it was set up, I used about 1/4 cup of marshmallow fluff. The cream held up overnight! Thank you for sharing! Can you use the whipped cream without the marshmallow fluff and will it stay -I want to use this so bad but dont eat marshmallows due to the gelatin content. Thanks for a fantastic idea! Yes, you can use whipped cream, but it will probably not hold up as well without the marshmallow. When whipped cream sits too long, it will start to leech water out, so make it and eat it right away! Thanks Dana, I am going to look into. Can you tell me which brand you use? most of the berries were somewhat hollow in the center (I did not core them) so there was nothing to keep them tight on the stick. Any suggestions? I did not have that problem. Mine stayed in place because they were sandwiched between the whipped cream and biscuit. 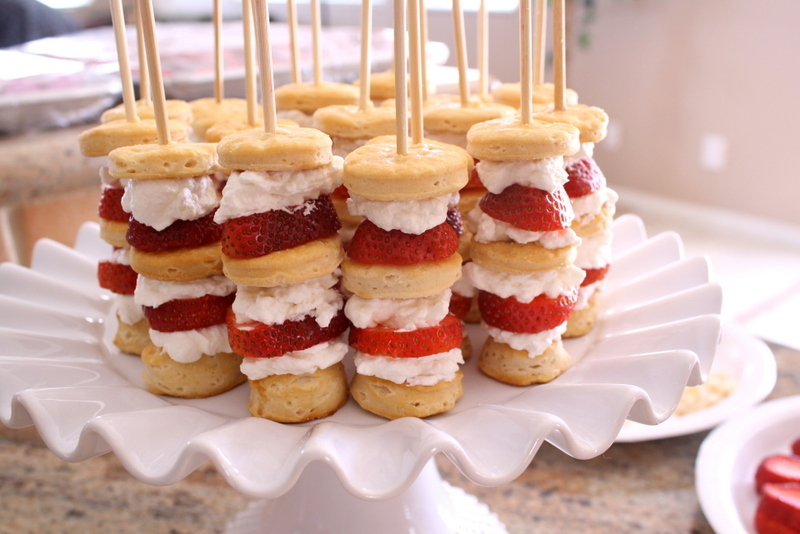 Maybe you can try pressing them a bit tighter between the layers or place them between layer of cream. Good luck! Can I use canned pizza crust instead of biscuits? Fixed the same way, what would the difference be? 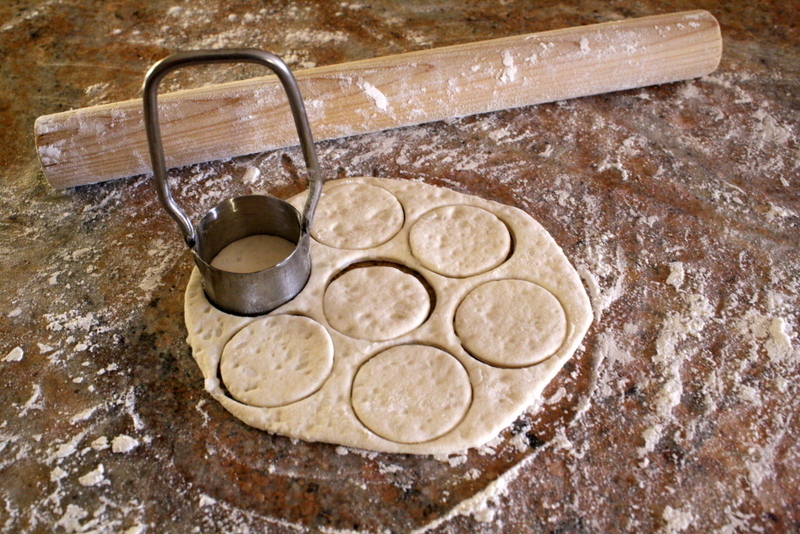 Pizza dough would be dryer and chewier than biscuit dough. 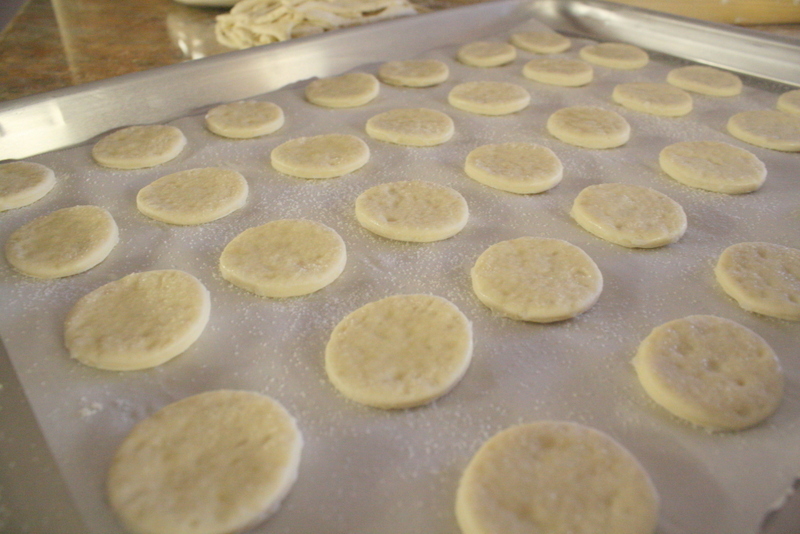 When you work with the biscuit dough, you’ll notice flecks of shortening in it that pizza dough doesn’t have. You should be able to find this in the baking aisle of your grocery store. It is made by Kraft, Jet-Puffed, the same brand that makes marshmallows. I am so going to make these! My kids and family will love them! I went to the grocery store today and noticed there was a 7oz jar of marshmallow fluff and also a 13oz jar. 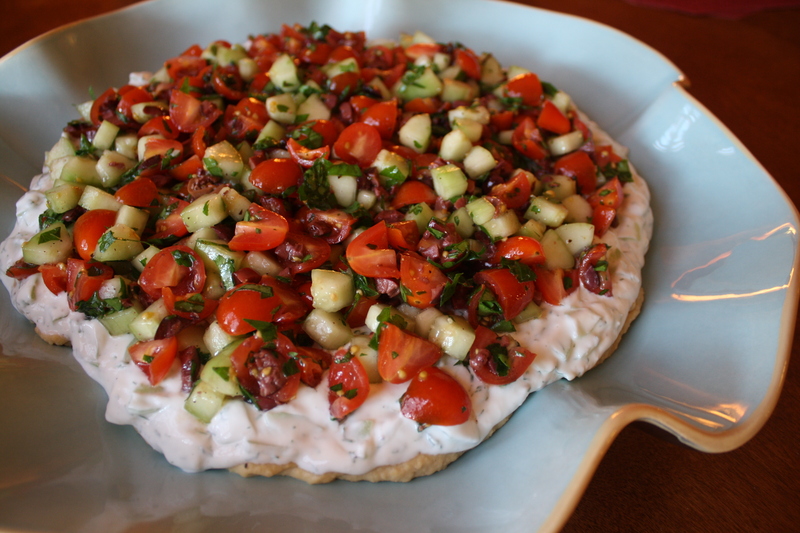 Which size did you use for this recipe? Thanks! I just made these, haven’t even clean up the kitchen yet, but I’m soooo excited to tell you that I found a new cool whip product that totally elimates the need to make the whipped cream. It’s called Cool Whip Frosting and it’s found in the freezer section. It tastes just like whipped cream but doesn’t get watery or melt! It comes in vanilla and cream cheese flavors. I used the cream cheese flavor and, oh…my…goodness!!! Yum! These are easy to make and so delicious that I hope there’s some for the baby shower I made them for! How did the whip cream hold up? I want to make these a couple hours before the party. It will hold up just fine for a few hours. Read some of the previous comments and see what other people suggested. Marcie, I’m so glad I found your comment! How much of this frosting did you buy (and how many kabobs did you make?) Thanks! I have the flaky reduced fat version of the grands will that make a difference? It shouldn’t make too much of a difference. Can these be made a day in advance? I’m having a BBQ on Saturday but have so many other things to prep that morning, would love to make these the day before. I am writing a blog post about unique ideas for birthday cakes for babies. I am linking to your recipe and was wondering if I could use a photo of your skewers in the post? I think these would make such a cute idea for a baby’s birthday cake! Thanks so much! Cindy, thank you so much for asking to use my pictures. You surely may! Please send me a link to your blog. I would love to check out your post! Heather, what did you do with the cream? It worked very well for me. It may not work well if you made the whipped cream in advance. There is a stabilizer that you can use so that the cream does not get watery. I have been seeing these all over pinterest and finally decided to open the link up. I am having a birthday party Saturday with tons of foods on skewers, thought I’d give it a try but too scared with the time issue (whipped cream). So, I think I will pass for the party but definitely try it out for friends & family soon. The comments left from others, really do help. Thank you again Karen for the creation & the beautiful pictures. I’m a picture person. Pingback: Top Recipes with Strawberries! That’s exactly what I made them for, a tea party birthday party for my daughter. Hi Karen! My name is Alex and I’m a writer at DailyBurn Life, a health and fitness editorial website. This recipe looks so delicious! I’d love to share it with our readers by including it in an upcoming article. If you can email me at alex@dailyburn.com for more details, that would be great! 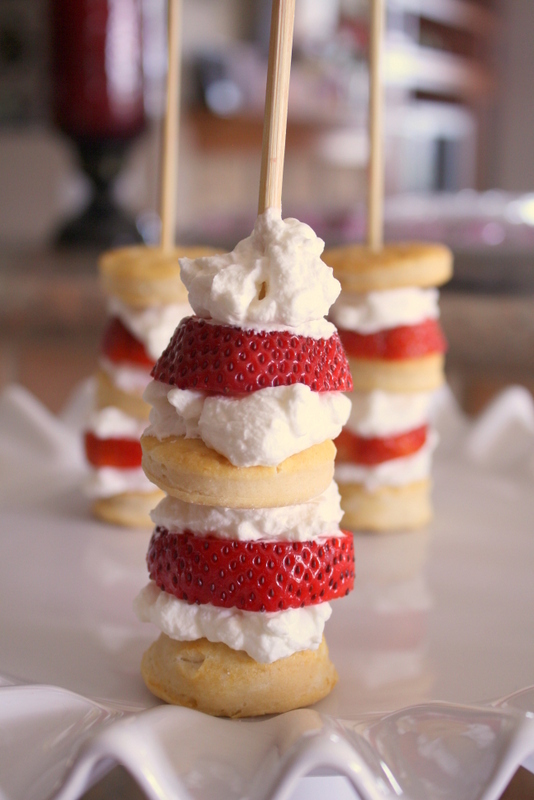 I think I will make these for the Fourth of July and maybe use blue sanding sugar on the biscuits. Thanks Beth, I’ll have to give that a try sometime! Is Marshmallow Fluff, Jet-puffed Marshmallow Creme by kraft? We love this recipe and are including it in a healthy Valentine’s Day guide for our Noom Coach users. With your permission, we would like to repost your picture with a brief description and link back to your blog for the recipe. If you’d like anything else included, please let me know! Hi Clare, I appreciate you asking about my post and of course you may use it for your site. Thanks so much, Karen! I’ll make sure to leave a reply when the article is live so you can check it out! You’re so welcome. I’d love to see the post! We just made these for a July 4th BBQ. I didn’t have a cookie cutter the right size so I used the top of a McCormick’s .09 oz spice jar. It worked perfectly.